Combine flour, baking powder and salt in a bowl. Set aside. In a large bowl, beat together butter and sugars until well mixed and fluffy. Add eggs and vanilla. Stir until combined. Mix in chocolate chips with a wooden spoon. Roll into small balls, place on a parchment lined baking sheet an inch apaprt, then gently press down each ball so that is flattened. Bake for about 15 minutes till golden. Cool on the pan then on a rack. Enjoy with a nice cold glass of milk! Hello. I'm assuming I need to add the flour mixture after the eggs and vanilla? Thanks! 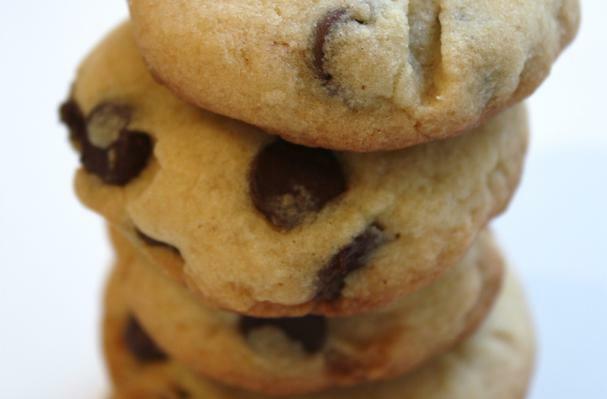 Every house needs a standard chocolate chip cookie recipe. These are the ones my mom used to make when we were kids. They're the light and puffy kind. Basic. Perfect with a glass of milk. When I make these, I make them small so that the boys can have 2 each when we eat them. They think they've hit the jack pot and I get a kick out of watching their faces light up as I pass out the 2nd cookie.